Miss a load? Late delivery? Always in a hurry? You definitely need an alarm clock to help you wake up. 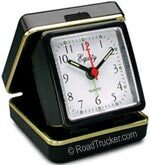 RoadTrucker offers you RoadPro′s "Super Loud" Alarm Clocks. 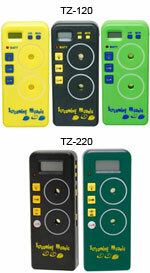 Or grab the one, that has 120dB alarm and is powered by 12-volts or a 9-volt battery. The Screaming Meanie is also a good choice when you are looking for an alarm clock that also functions as a timer. The Electronic Big Digit Clock 1324 has green night-time illumination feature which is perfect for your evening travel. Custom Accessories combines the power of three useful functions, with the Clock, Compass and Thermometer Combo. You can also try Equity′s Super Loud Digital Clocks, the E30902 with red LED display and the 31015 with blue LCD display. 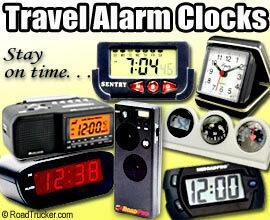 Equity′s Quartz Folding Alarm Clock is perfect for travel with its fold-up protective case. Stay on track with your duties and manage your time with the right choice of clock. Custom Accessories Clock, Compass and Thermometer Combo for those wanting just a little extra from their clock. Package Size (LxWxH): 4.62" x 5.62" x 1.13"
Equity′s digital clock has a blue backlit display which indicates the time and speakers for a super loud sound. The Indoor/Outdoor Thermometer displays time and inside/outside temperature. It comes with ice alert to warn drivers of icy road conditions. The Quartz Folding Travel Alarm Clock features Luminous Hands and Dots and can be easily stored away just about anywhere.